Martha Stewart, the veteran TV personality and retail executive, is partnering with Canopy Growth Corp. (WEED.TO), the world’s biggest cannabis company, as an advisor to develop a new line of pot-related products, the company said Thursday. On Feb. 23, the Virginia Senate passed a bill allowing school health care providers and nurses to administer medical cannabis to elementary and secondary public school students on school property and at school events. Currently under state law, possession of any cannabis product on school grounds may result in expulsion and reporting to law enforcement. Zynerba Pharmaceuticals, Inc. (NASDAQ:ZYNE), a specialty pharmaceutical company dedicated to the development of innovative transdermal synthetic cannabinoid treatments, today announced that the U.S. Food and Drug Association has granted orphan-drug designation to ZYN002 cannabidiol (CBD) gel, for the treatment of Fragile X syndrome (FXS). Fragile X syndrome is a genetic condition that causes intellectual disability, anxiety disorders, behavioral and learning challenges and various physical characteristics. Zynerba Pharmaceuticals, Inc. (NASDAQ: ZYNE), the leader in innovative pharmaceutically-produced transdermal cannabinoid therapies for rare and near-rare neuropsychiatric disorders, today announced that the U.S. Patent and Trademark Office has issued US Patent No. 10,213,390, titled “Treatment of Fragile X Syndrome with Cannabidiol” which includes claims directed to methods of treating Fragile X Syndrome by administering a therapeutically effective amount of synthetic or purified cannabidiol. Ice cream sammies with CBD oil? What a rush! 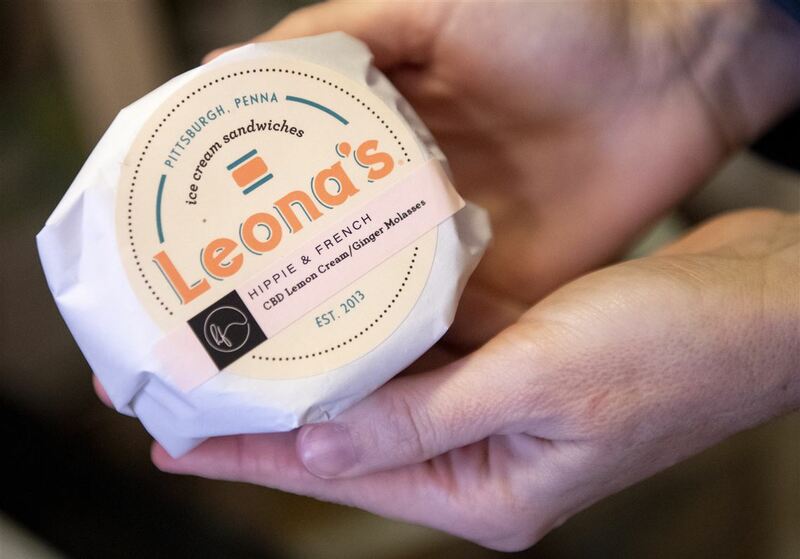 Hippie & French in Lawrenceville commissioned a limited run of Wilkinsburg-made Leona’s Ice Cream sandwiches, each with 20 milligrams of CBD, or cannabidiol oil, in lemon cream ice cream between original-recipe ginger molasses cookies. The boutique sold all 60 of them — at $11.50 each — in about two hours. For The Earth Corporation (the “Company” or “FTEG”) (OTCMKTS: FTEG) is excited to announce immediate plans for the establishment of a new state-of-the-art CBD extraction and production facility to be located in Eugene, OR. The facility will complement the Company’s already-established retail CBD footprint, which includes mall stores, mall kiosks, vending machines, and e-commerce storefronts, with physical locations in both Las Vegas and New York City. Elixinol Global Limited FY2018 Results Strong Revenue Growth of 121% Supported by Robust Balance Sheet to Drive Future Growth Elixinol reported revenues of $32.5m up 141% on FY2017. Elixinol has continued strong revenue growth across all sales channels which include direct to consumer, wholesale, private label and bulk sales led by broader consumer awareness and demand for hemp-derived CBD products. The CBD Store; selling Elixinol online since February of 2014. Eight Oklahoma colleges are partnering with farmers in a new program to study the growth of hemp. The 163-3 vote calls for Georgia to join the 41 other states that already permit hemp cultivation, said state Rep. John Corbett, a Republican from Lake Park. 150 Kilos of Crude Left Like to get this Done ASAP, so Price is Reflecting This. All 150 Kilos for $1575 per Kilo! This stuff is highly refined. Attached is the COA, would love to help these guys out quickly. 5000 for 1 willing to negotiate for more. Looking for hemp stocks and stems to purchase. Need 500 metric tons. I bought this and haven’t used it. I will need a heat source, I planned on putting a gas grill burner in it. It can handle just over 1500 pounds an hour. The CBD Store Owns the Following online properties.